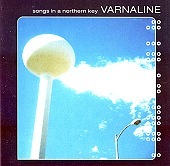 Best described as a folky, rootsy pop album, Varnaline's Songs In A Northern Key is too bold, too artistic, and too enjoyable to be pigeonholed. Incorporating elements of the three previously stated styles, the band creates a warm, friendly collection of songs that travel from loud to quiet, poppy to singer-songwriter, and rock 'n' roll to roots music. A truly engaging, eclectic work of art. "Let It All Come Down" is a smoldering, burning rocker, sitting there waiting to erupt like a dormant volcano, while "Indian Summer Takedown" is a laid back, heartening song that is as much soul as it is folk, and as much rock as it is Americana. "Blue Flowers on the Highway" will make your head spin as it weaves pop with dark folk. And then there is "Down the Street", a gusty number that travels through singer-songwriter storytelling, roots depth, and a rocking forefront. Bands like Varnaline don't come around often. They manage to turn rock 'n' roll, pop, and Americana into a singular sound, one that fans of each will dig. Simply put, Songs In A Northern Key brings fans of music together, whether you like pop or roots, they find a way to make you love their album. I'll give it an A+.